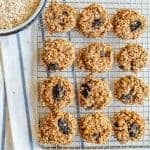 Vegan breakfast cookies that are packed with all kinds of healthy nuts, seeds, whole grains, and healthy fats to keep you full all morning long. 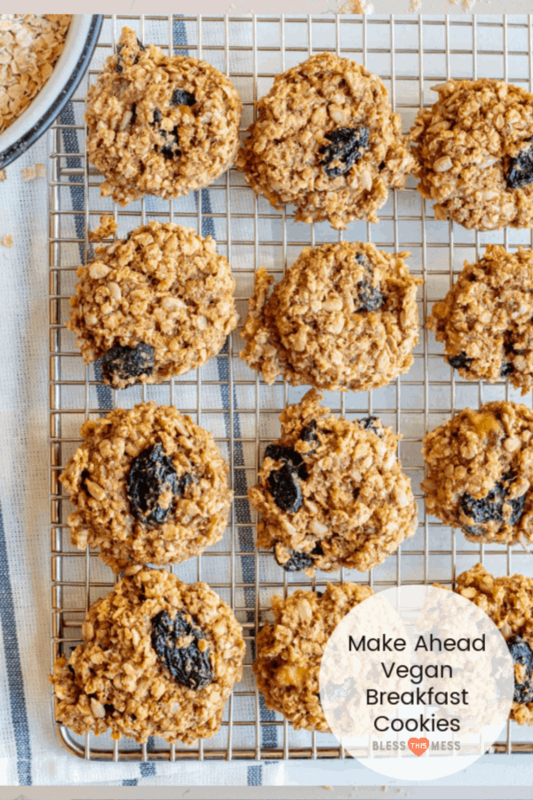 I’m always looking for make-ahead quick and easy breakfast ideas and these breakfast cookies are one of our all-time favorites. Who doesn’t want to eat cookies for breakfast?! 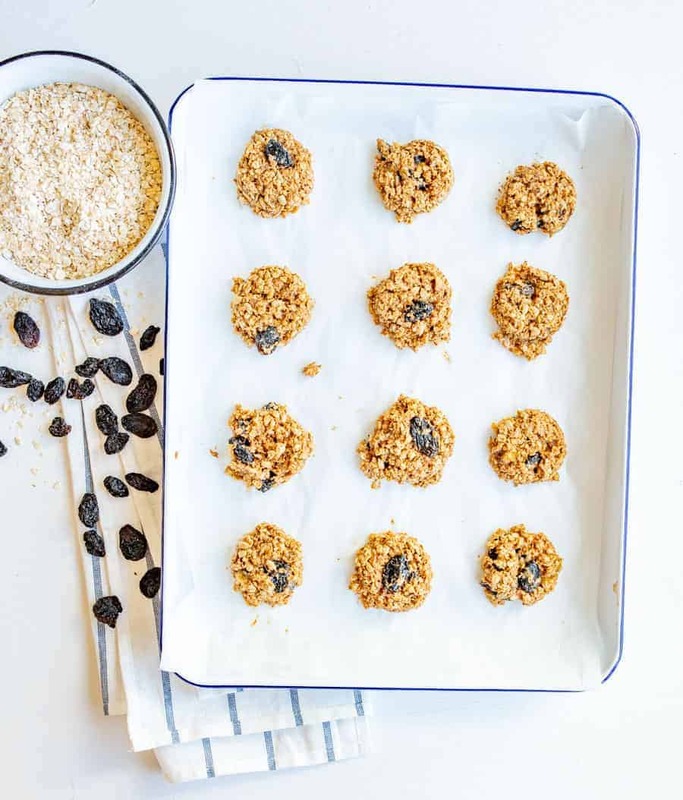 These cookies are vegan (which means they’re also very allergen-friendly depending on your needs) and made with all kinds of delicious and wholesome ingredients. The oats are whole grains and provide all kinds of fiber. Peanut butter adds great flavor, fat, and protein. Banana, maple syrup, and applesauce help to sweeten and bind the cookies together. I also love that you can customize them with different dried fruits, chocolate, nuts, or seeds. 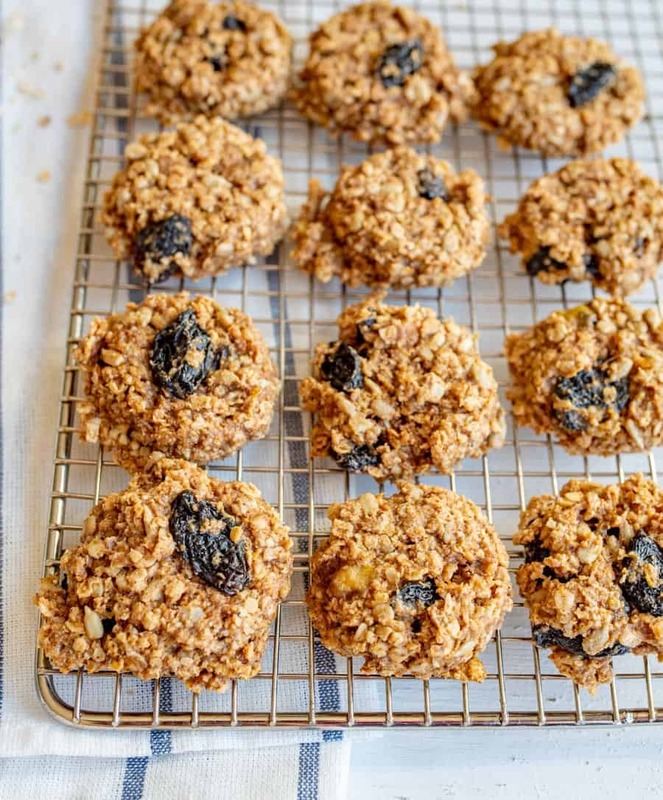 Breakfast cookies are a quick way to get lots of nutrition in without much work on your part. 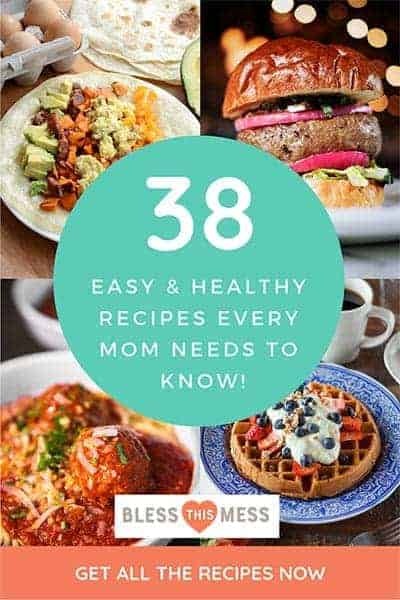 They are also portable, easy to store, and super versatile (think easy lunch box additions, snacks, and bedtime treats). Use what you like and have! My kids love the chocolate chips and I love dried blueberries and pecans. You can make whatever sounds good to you. Feel free to add a teaspoon of cinnamon to this recipe if you like. These store great so make a double batch and stash some in the freezer for later. Can you substitute old fashioned oats (regular) for quick cooking oats? You can in some recipes, but I’d recommend not subbing them for these cookies. If you don’t have quick cooking oats you could put your old fashioned oats in the blender and pulse it a few times to cut them into smaller pieces. 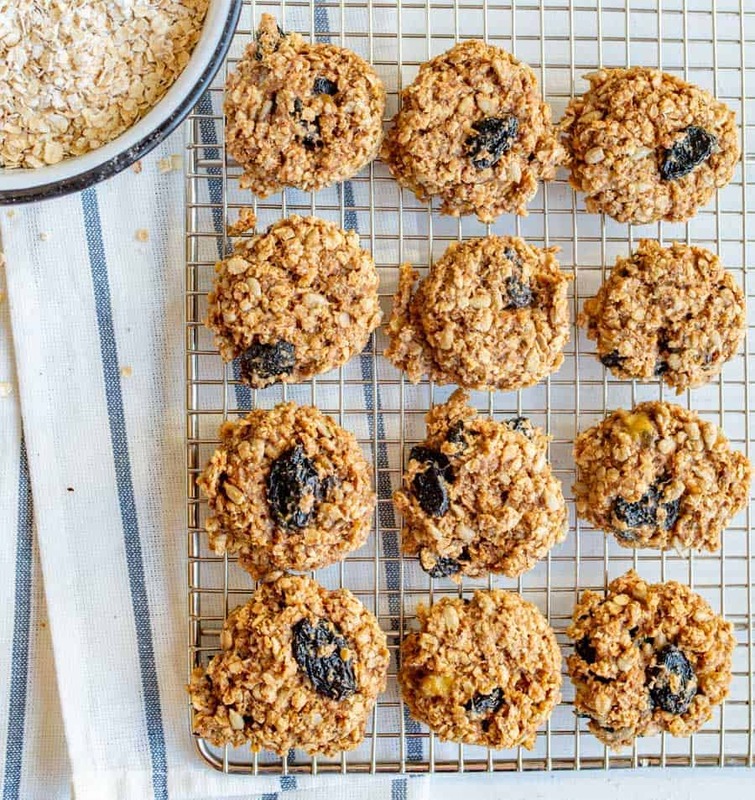 Can I freeze vegan breakfast cookies? Yes! They freeze great. Just let them cool completely and then store them in an air-tight container in the freezer for up to 3 months. Allow the cookies to come to room temperature before eating (it takes them about an hour to thaw at room temperature). Preheat the oven to 325 degrees F. and line a baking sheet with parchment or a baking mat. In a large bowl, mash the banana well with a fork until there are no longer any large chunks. Add the peanut butter, maple syrup, and applesauce and stir to combine well. Add the oats, salt, cinnamon, and ground flaxseed (if using). Stir well to combine. Add the dried fruit and/or chocolate and the sunflower seeds and stir to combine. Scoop 1/4 cup of the mixture and place it on the cookie sheet. The cookies won’t spread at all so press the tops down as needed to your desired size and thickness. Bake for 14-16 minutes until the centers are set and no longer shiny. Allow the cookies to cool on the baking sheet. Cookies can be kept at room temperature for 5 days or in the freezer for up to 2 months. Use what you like and have! 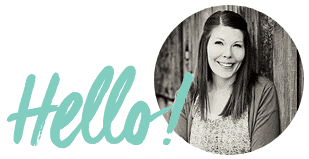 My kids love the chocolate chips, and I love dried blueberries and pecans. You can make whatever sounds good to you. Hope this recipe is helpful and makes your busy mornings a little quicker!